[Top Hardware Settings]: RK MAX powered by Quad-core cortex A7 processor which runs up to 2 GHz, you can enjoy videos flawlessly with Quad-core Mali 400 GPU. These features make your box running faster than other boxes on market! You will notice naturally when you watch a live or play a racing game. [Android 6.0-Rapid & Stable System]: RK MAX comes with Android 6.0 OS, great improvement in equipment and compatibility, which make it run games smoothly. Say good bye to the system freezing and buffering. 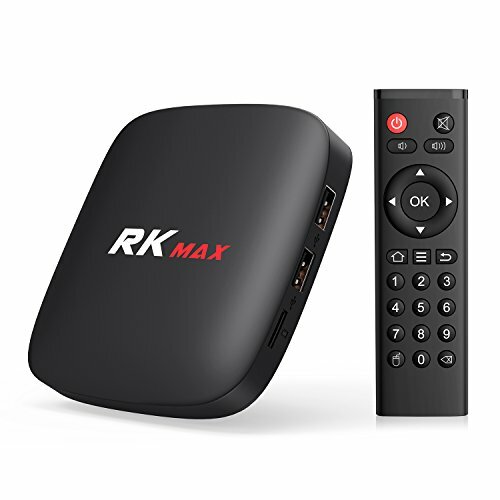 [2GB RAM + 16GB ROM & 4K display]: RK MAX TV box is built with 2GB/16GB, 16GB ROM gives you more space to download your favorite APPs and videos and 2GB RAM makes your apps run fluently. 4K x 2K H.265 hardware video decode and 4K x 2K output, offering you high definition picture and fluently video playing. It's perfectly compatible with your HD 4K home TV. [Great Remote Control]: RK MAX has an excellent Remote Control. You can press the button at any place in your room and get a quick response to the box. The remote control is flexible and has a good touch. It will bring you a brand new experience about android box. RK MAX also supports Ethernet 10/100M, standard RJ-45 and 802.11b/g/n Wi-Fi. [Best After-Sale Service]: This item is backed by 1 year warranty. If you have any question during usage, please contact us, our technical team will provide you professional problem-address solutions. If you have any questions about this product by TICTID, contact us by completing and submitting the form below. If you are looking for a specif part number, please include it with your message.